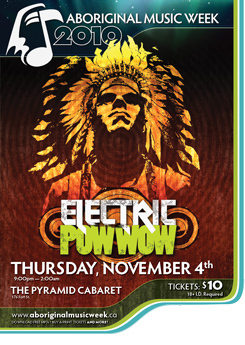 The fearsome foursome behind Ottawa’s ELECTRIC POWWOW are bringing their beats to Winnipeg for Aboriginal Music Week 2010. Anchored by four Native DJs spinning the best in hip hop, dancehall, electronica and mash-ups, the EP crew consists of Bear Witness, Deejay NDN, Deejay Frame, and DJ Shub. DJ Shub is a 2-time Canadian DMC DJ Champion and a DMC Canadian Supremacy Champion. What do the letters ‘DMC’ stand for? When he is not busy turntabling, Bear Witness writes and directs experimental films and videos. Can you name one? With which Canadian punk band did Deejay NDN once go on tour as their drummer? Deejay Frame is a member of the Mi’kmaq people. Using phonetic spelling, how would you correctly write out the pronunciation of “Mi’kmaq”? « If privatizing Indigenous lands is such a great idea, why the uproar over privatized PotashCorp?